As a stand alone design project, TPS was commissioned by the NGT team at the West Yorkshire Combined Authority to design and produce a 12 page brochure including ‘throw out’ page to provide an informative insight and update into the New Generation Transport Project, to be circulated to key business audiences within Leeds. 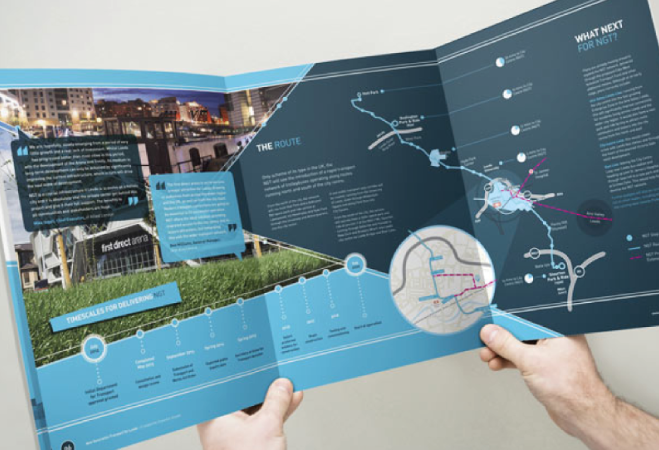 The brochure designed with a fusion of text and images provides the reader with quick reference points to the key elements of the scheme and the use of images, showcasing the Trolley Bus around identifiable landmarks within Leeds, assists in providing a visual representation of how the overall scheme will sit within the existing infrastructure and surrounding environment of Leeds City Centre. The brochure, set in the unique colour tones of NGT (Blue and White) ensures the brand is easily recognisable whilst maintaining a strong marketing presence.